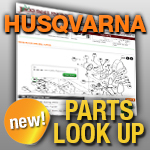 Husqvarna Carburetors and Parts 4-Cycle: If the carburetor on your Husqvarna mower is clogged or gummed up, you can try to clean it. But if the damage is excessive, you'll need to replace the entire carburetor assembly. More and more small engine equipment are needing carburetor replacements due to the addition of ethanol fuel in gasoline. The fuel breaks down the fuel system components and clogs the carburetor.